* Please do not inquiry if you have a pet and you will not bother to clean up after your pet, including inside the house, because you are on vacation. Only responsible pet owners inquire. 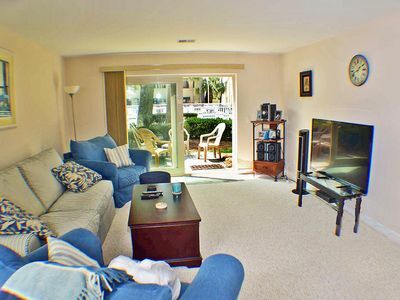 * IF YOU ARE LOOKING FOR PROXIMITY TO THE POOL, TENNIS COURTS AND BEACH, LOOK NO FURTHER! 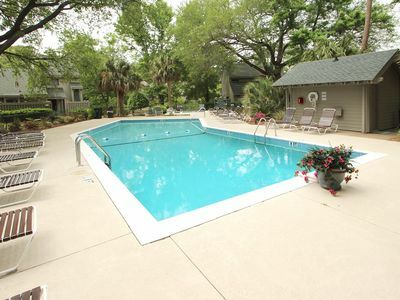 1 MINUTE WALK TO POOL, 3 MINUTE WALK TO VAN DER MEER TENNIS COURTS & 8-10 MINUTE WALK TO BEACH!!! BEACH LOCKER INCLUDED! ATTENTION: HomeAway's rate method does not work for my rates. Please do not look at the DETAILED quote amount. Inquiry and I will answer, or look under notes, in the rate section. New 48 inch Flat Screen SmartTV added in October 2014. FOUR bikes included with your rental. Save money on renting bikes for the week! Added in Nov. 2011 - DVR in the Living Room. Now you can go out and enjoy the day at the beach and record your shows. Watch them later! 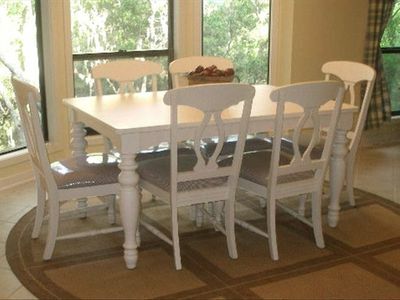 Come stay at our renovated holiday villa. There is nothing like staying in a place that has nice amenities. Downstairs we added another loveseat with a DVD/VCR player and a 19' flat screen TV (all new!). If you are watching something in the living room the kids can stay on the same floor and watch something else in the other room, off the kitchen. 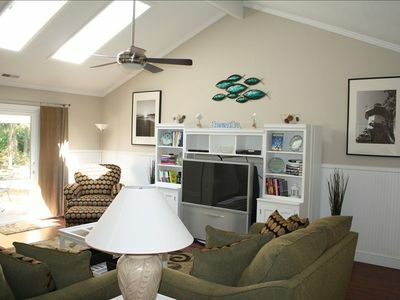 Very few villas have this extra TV/Study room - especially on the first floor. We also added GameCube with Games in this room! Prepare your meals and have the kids close by. 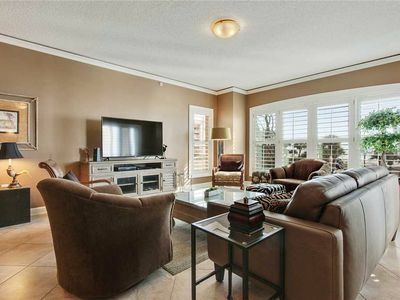 On the main floor, along with the above additional room, enjoy our beautifully decorated and furnished living room overlooking the Golf Course. Our Sleeper Sofa has a Queen size bed. Relax and fall asleep in our oversized comfy recliner! Relax to the sound of the Stereo with the 6 CD changer player or watch TV on a big set which has a DVD player. You may never want to leave this great comfy chair (replaced in Feb 2016). There is also a desk area with a printer. 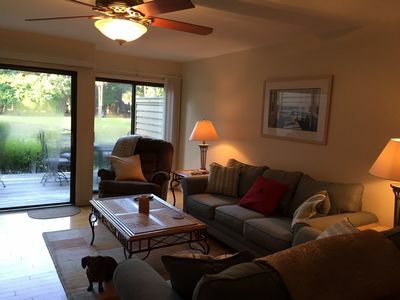 Along with everything in our living room enjoy a lighted ceiling fan with remote control, for those of us that enjoy a little extra breeze on hotter days. The kitchen is fully stocked and has many new amenities. There is a half bathroom which has been renovated and updated. 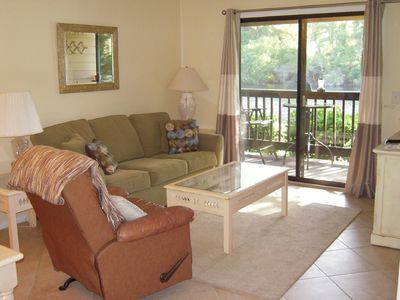 There is cable TV throughout and Broadband Wifi Internet Access! Moving upstairs, enjoy the added room of a king sized bed in the master bedroom with another lighted ceiling fan with remote control (Ladies, this comes in very handy for me! The remote stays right by my nightstand. LOL). The master bedroom has a walk-in closet and a TV with a VCR player. The master bathroom has all new vanity, sink, faucet and mirror. The 2nd bedroom has two twin beds, with a 19' Flat Screen TV and DVD/VCR player. The 2nd bathroom upstairs has all new vanity, sink, faucet and mirror. Also, there is a full sized washer and dryer upstairs. There are a total of FOUR TV's in our villa - plenty of TV's to go around. 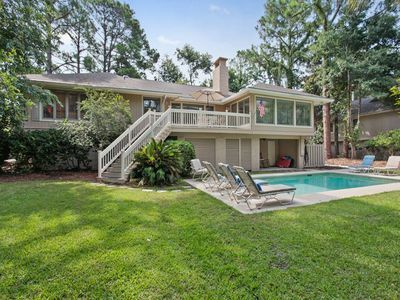 If you don't want to watch TV, relax on the deck and watch the golfers play golf on the 7th hole. Have a BBQ with our new WEBER GAS GRILL and enjoy the peace and tranquility of the area. That's the life! Or, take the path to the beach, in the shade. 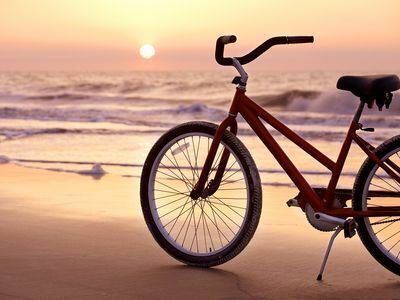 Ride on our FOUR available bikes, walk or drive to the beach. Our villa is one of the closest villas to the beach. Everything is within a 5-7 minute walk! 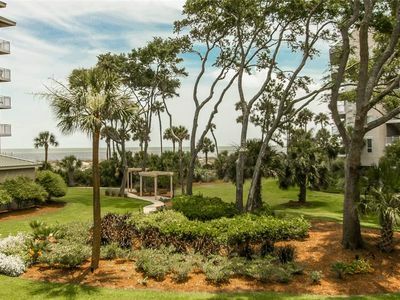 The Shipyard Plantation is a security patrolled, gated community with lighted walking / biking paths and golf courses throughout the property. 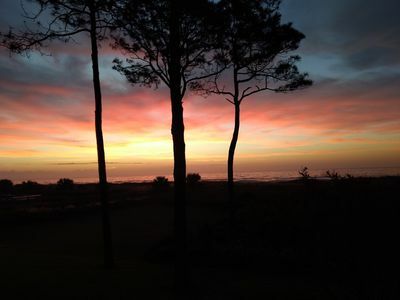 Shipyard is nestled between Sea Pines and Palmetto Dunes. 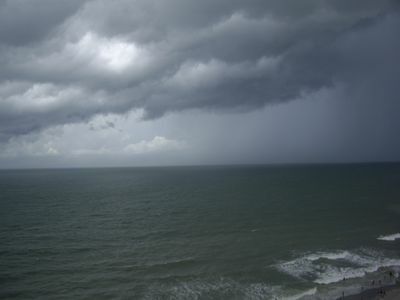 It is only a few miles from the Harbour Town Lighthouse Marina and Golf Links. 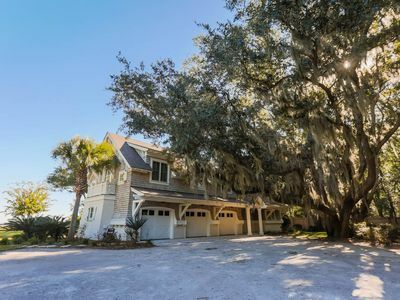 The Greens development (within Shipyard) is known for its close proximity to the renowned Van Der Meer Tennis Courts, tall shady trees and quiet and relaxing setting. Our Villa sports a beautiful view of the Shipyard Golf Course off the rear deck and is centrally located in The Greens development. 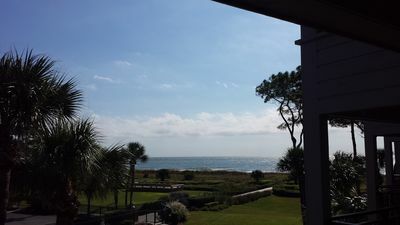 ONE OF THE CLOSEST DEVELOPMENT, WITHIN SHIPYARD, TO THE BEACH! For your convenience we have beach chairs and a buggy to take to the beach, along with other amenities. We now have a BEACH LOCKER! 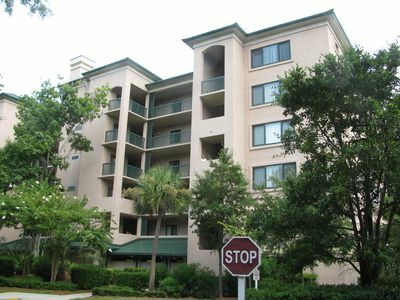 Five minutes away is Forest Beach and the famous Coligny Plaza which contains over 70 shops. There are 14 restaurants, ice cream, Java Joe's Coffee Cafe and much more. Use the Pope Ave. exit. As a bonus, we have a local agent to provide 24/7 on-call service should you need assistance. What would you do if there is a problem? Whether it is a small problem (I need more towels, etc.) to a bigger problem (the toilet flooded, etc. ), with the 24/7 service they will assist you immediately. There is nothing like having the security of someone being there in the event something happens during your stay, quickly. We hope you enjoy your stay in our Little Taste Of Paradise! 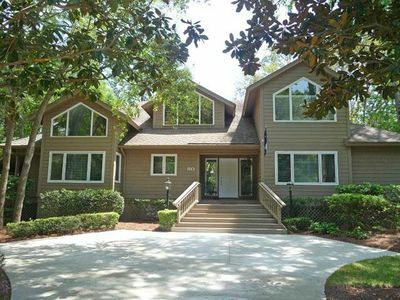 Spacious renovated two-story Hilton Head home - 3rd row! 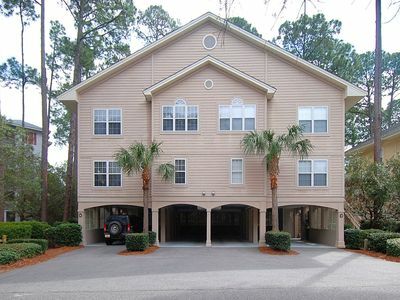 Hilton Head Condo w/ Resort Pools - Walk to Beach! 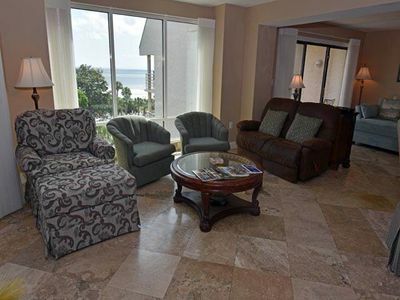 3BR 3BA Condo By Pool & Lagoon. 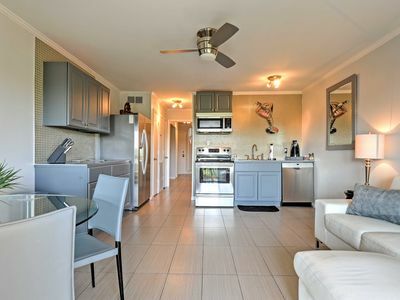 Close to Beach, Shopping, Restaurants. 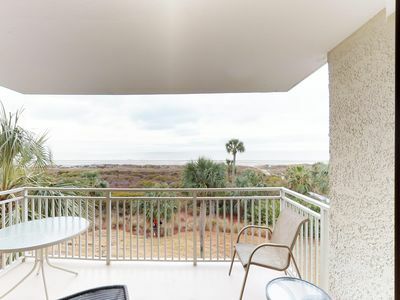 Stunning lagoon views and short walk to the beach! 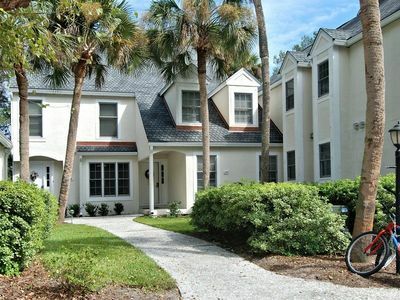 4 bedroom, 4.5 bathroom townhome in Port Royal, 3 mins to the beach, 1 min to the pool!